earmarks of being battling numerous fights only four months in the seat. Ground-breaking governors and legislators are determined to have their ways. 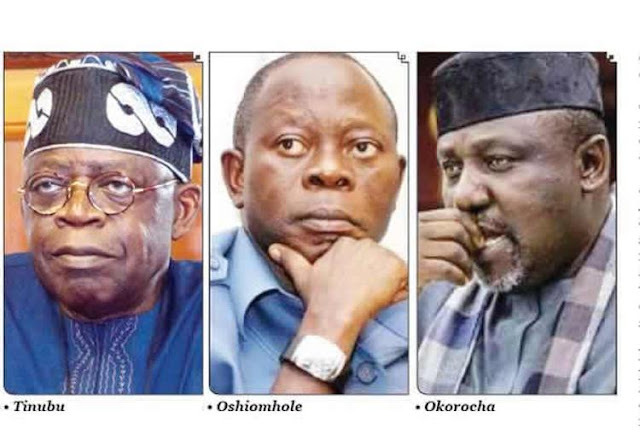 What's the exit plan for Oshiomole and the decision APC? These are trying times for the ruling All Progressives Congress and its National Chairman, Adams Oshiomhole. Keen watchers of the unfolding political events within the party are of the view that Oshiomhole’s clamour for party supremacy and discipline may have endeared him to his staunch supporters, including President Muhammadu Buhari. However, his combustible personality and inflexible approach to issues have apparently alienated him from the majority of party faithful, particularly some APC governors. The seething crises in the various state chapters of the party have further demonstrated that the former Edo State governor may be riding an unwilling horse. Oshiomhole rode to power on the wings of great expectations following the exit of his predecessor, John Odigie-Oyegun, who was literally hounded out of office. Having secured the endorsement of the President and a former Lagos State governor, Asiwaju Bola Tinubu, Oshiomhole’s emergence as party chairman was a done deal. Oshiomhole’s fight to stamp his authority on the party started quite early. From his well publicised face-off with the Minister of Labour and Employment, Chris Ngige, whom he threatened to sack from the party for not constituting the board of the Nigeria Social Insurance Trust Fund to the threat to sanction the Minister of State for Aviation, Hadi Sirika, for a similar offence. The rippling effect of what was considered as his intemperate outbursts had yet to abate when he launched a verbal offensive against Governor Samuel Ortom of Benue State for defecting to the Peoples Democratic Party. Describing him as a failure, the APC Chairman said he was relieved that the governor left. Ironically, Oshiomhole had persuaded Ortom not to leave the party about a week earlier. “I am relieved as national chairman, and I believe that the leadership of the party in Benue is also relieved that Ortom has left the party and returned to the club he belongs, a club whose philosophy is to share the money and not develop communities,” he said. Like a warrior without an armour of discretion, the APC boss yet again got involved in a fresh political tango with the Senate President, Senator Bukola Saraki, who had defected to the PDP. He issued torrents of threats against Saraki and admonished the APC lawmakers in the Senate to impeach the Senate President. Oshiomhole, however, insisted that Saraki should immediately resign as Senate President or be impeached. “The only way Saraki can avoid impeachment is for him to do what is honourable, which again leads to the issue of character,” he stated. There were reports that the party chairman met secretly with the APC lawmakers where they perfected plans to impeach Saraki. The invasion of the National Assembly by operatives of the Department of State Services on August 7 was attributed to some Presidency officials in cahoots with Oshiomhole to pull the rug from under Saraki’s feet. The plot failed and the then Director-General of the DSS, Lawal Dauda, took the hammer for the failed conspiracy. The loud accusations and protests that trailed the congresses which had resulted in litigations had put the chairman in a tight spot and provided the oil needed to roast him. Disenchanted party leaders and members in Bauchi, Zamfara, Rivers, Ogun, Imo and other states have either called for his removal or were working with other aggrieved colleagues to ease out the APC chairman from office. Critics also cite the Lagos State governorship primary, which produced Jide Sanwo-Olu as winner after Clement Ebri, the Chairman of the National Working Committee electoral panel, had earlier said no election had been conducted and that the electoral materials were still with him. Less than 24 hours after, Ebri made a volte-face after he was told to accept the results by Oshiomhole, obviously in deference to Tinubu, who had kicked against the re-election of the incumbent Governor, Akinwunmi Ambode. The recent news about his encounter with operatives of the Department of State Services has also raised the stakes. Allegations and counter allegations about financial impropriety with respect to the concluded party primaries led to the alleged intervention by the DSS. Political analysts say that incident and other actions taken by the APC chairman are responsible for his woes which may hasten the downfall of the party in the 2019 general elections. From great expectations, the chairman is currently facing strident calls on him to resign from office by several aggrieved party members. He observed that the PDP faced the same kind of crisis when it was in power, describing it as a sickness that afflicted the ruling party in the country. “What is at stake is not service to Nigerians but safety of political investments. Each time, it was always more toxic, the same thing happened in the PDP when it was the ruling party. “Politicians have conditioned their minds that power is the only way to guarantee comfort, influence and wealth. It is not about ideology, or ideas or core value. What is happening is natural fallout of a bankrupt party system, a free-wheeling system that has no structure,” Onunaiju said. A political watcher, Dare Atoye, observed that the APC leadership was involved in a supremacy fight with about four governors which might not augur well for the party in the 2019 polls. “It is already late in the day to convene a meeting to assuage those who are aggrieved in the primaries. I think it’s going to take them a lot more to get out of the problem which has been compounded by litigation and I blame it on the President. “If he had done the right thing, they wouldn’t have been in this mess. So, as it is, they are not likely to have Imo, Zamfara, Rivers, Ogun and other states. I think they have not managed party politics very well. If they are able to survive it (crisis), they would pay for it in terms of electoral fortune in 2019,” Atoye stated. A social commentator and human rights activist, Mr Ebunoluwa-Olu Adegboruwa, advised Nigerians not to take sides with the warring chieftains of the APC, saying the issue tearing them apart had nothing to do with the common good of the masses. Describing the ruling party as an amalgamation of strange bedfellows, the lawyer, however, said the disintegration of the party was too early. He said the sharp disagreement between Oshiomhole and APC governors could have a negative effect on the chances of the President and other candidates of the party in the next general elections, which are a few months away. Adegboruwa added, “I believe generally that the events going on presently in the hierarchy of the APC are just a signpost of things to come as we move closer to the 2019 elections. It is a political party of strange bedfellows. When you talk about (former members of) the CPC, ACN, APGA and ANPP, these are people with different understanding coming together to deceive themselves that they have a coalition. We know that sooner than later, things will soon tear apart and we have not seen anything yet. “But I think the lesson of the crisis in the hierarchy of the APC is the inability of political parties in Nigeria to be driven by ideology. If there are ideologies targeted toward the common good, even if there are personal disagreements, they will not affect the common goal of the party. So, political parties in Nigeria have nothing to offer in terms of principles and ideologies and that is why we witness the reign of godfathers and the reign of tinny gods within political parties. This is not just within the APC but the PDP and other political parties. “I think Nigerians should be careful to not join the fray in the seeming division within the APC. They don’t deserve our sympathy because the issues between them have nothing to do with the masses but their selfish interest. It is the self-interest of Governor Rochas Okorocha; it is the self-interest of Governor Ibikunle Amosun; it is the self-interest of Governor Rotimi Akeredolu and Comrade Adams Oshimhole. So, Nigerians should be careful not to be drawn to their battles. An APC member in Ondo State, who spoke with a Correspondent on condition of anonymity, argued that the party was already falling apart due to the crisis in the party. Although the spokesperson for the APC, Lanre Issa-Onilu, agreed that any crisis allowed to fester in a party could affect the chances of such party. He dismissed insinuations that the ruling party could lose the 2019 elections. Speaking in an interview with The Punch, Issa-Onilu said, “Whatever disagreement that is not resolved before elections will have impact on the chances of the party but that doesn’t necessarily mean that the party is going to lose the elections. However, you don’t underrate any disagreement.